Introducing The Longevity Blueprint Quest… A Roadmap To A Fitter, Healthier and More Youthful You. Experience The Rapid Science-Based Biohacks Ben Greenfield Uses With World Class Athletes, Top CEOs, And Other Top-Performers To Effortlessly Level Up Your Health, Wellbeing And Longevity. Does it ever feel like your body, your health and your energy levels just aren’t quite what they used to be? That every aspect of your wellbeing just seems to be deteriorating year after year after year? You could be a fitness enthusiast in decent physical shape – but you’re beginning to notice that you need to exercise longer and harder than usual just to maintain your strength (only to feel more beat up, sore and exhausted the next day). Or you could be a productive and successful executive – but finding the time for those 1-hour, 3 times a week gym sessions to keep your waistline in check always forces you to sacrifice another part of your life. Or you could be in your later years – but you’re not enjoying your free time the way you imagined, because you just don’t have the energy and strength you once had, or worse still, you’re finding yourself spending more and more time nursing new aches and pains. “Well, that’s just age catching up. What isn’t natural are our beliefs about HOW we age. All of the above and more, is what our post-industrial society has taught us how “growing old” is supposed to look and feel like. That no matter who you are, eventually, we’ll all be relegated to being weak, frail, and lethargic in our later years. Longevity scientists have long been fascinated by specific regions around the world known as the “Blue Zones”, which sees the highest proportion of centenarians relative to their population size than any other community on the planet. But these individuals aren’t just living long. They’re living well. They’re thriving. They’re savoring life. They’re vibrant, robust and healthy, and remain physically active well into their 70s, 80s, 90s and even into their 100s. And most importantly, they’re happy and deeply fulfilled. After decades of study, researchers began to piece together the puzzle behind these communities’ remarkable longevity and wellbeing. They regularly engaged in light physical activity – walking, cycling, fishing, hiking – interspersed with short bursts of harder labor – farming, building fences, lifting heavy objects. They exposed themselves to a healthy dose of sunlight each day, had access to clear, fresh air, and clean water. They placed an immense importance on communal life, building strong bonds with friends and family. What you won’t find in these communities are people exercising for hours in the gym or having regular appointments in a beauty spa. Question is, is it possible to emulate this holistic practices into our busy post-industrial lifestyle? 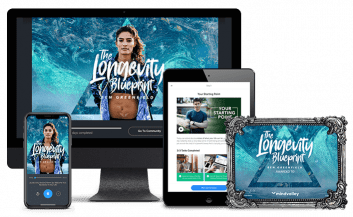 The Longevity Blueprint Quest combines many of the time-tested traditions of the “Blue Zone” communities with some of the most cutting-edge science in body performance. The result: Powerful protocols that take just 5-20 minutes to do that naturally triggers physiological changes in your body for a complete and total transformation of your entire wellbeing — from your strength and your mobility, to your energy levels and your longevity, and more. What you won’t find in this Quest are hard 60- or 90-minute workout routines that leave you drenched in sweat, exhausted and sore. … Science has repeatedly shown that they can do more harm than good. If you can just run that extra mile, push that extra rep, endure an extra workout, then you’ll inevitably get closer to that trim, ripped, healthy body you’ve fantasized about for years. But the latest science has proven that 60-minute workouts can cause widespread inflammation in your body, damage your cardiovascular system, erode your joints, and age you far beyond your chronological age. The truth is, you simply can NOT “out-fitness” your way to good health. Most fitness programs today tend to only focus on just one thing — Your physical fitness. And even then, it may only cover ONE aspect of your fitness such as muscular strength, or cardio, or flexibility. Craft a robust body that moves the way nature intended. Enjoy the activities you love free of chronic aches and pains. Start feeling, moving, and looking far younger than your chronological age. Turn your body into a fat-burning machine throughout the day. Quickly rebound from muscle soreness and rapidly heal injuries. Sleep like a baby and wake up each morning feeling like a million bucks. Pursue your passions and goals without any sign of lethargy slowing you down. Dramatically enhance your body’s resiliency to illness or disease. Reduce your chance of injury and project a picture of vibrant, robust health. But Are You Adding More “Life” Into Your Years? In a 2016 lecture by Singularity University, researchers predicted that exponential advancements in our medical practices has, and will continue to extend our average lifespan year after year. Researchers estimate that for every year you live, science will add an additional 3 months to your life expectancy. And by year 2030, that may go up to almost a year, for every year you live. The truth of the matter is, our life expectancy will rise. And for many of us, and certainly our children, seeing our 100s may be far more common than you’d expect. … It’s up to you to determine how much life you add into your years. Would you rather settle for the today’s common belief about what it means to grow? Where you’re plagued by aching joints and muscular pain? Where diminishing strength and reduced mobility is accepted as a norm? Where you’re watching life happen from the sidelines instead of experiencing it? Or would you rather spend every waking minute savoring all that life has to offer with youthful energy, vigor, and confidence? If you said “yes” to the latter, the Longevity Blueprint Quest: a complete 60 day wellness transformation, designed to enhance your fitness, your health, your beauty and your longevity is for you. A profound 17 year difference. Best part was, the techniques he used to achieve this did not require a experince equipment, they were not complicated to perform, and they did not take a lot of time to see results. In this Quest, Ben will reveal his most effective techniques, biohacks and strategies so you too can elevate all aspects of your wellbeing to new heights. The Longevity Blueprint Quest is NOT a fitness program, so you won’t be subjected to long, grueling workouts. Instead, this Quest is an easy-to-follow process to systematically enhance your overall wellness so you develop a body that looks great, feels great, works at its full potential, and lasts. For 8 weeks, you’ll join Ben Greenfield in a series of simple 15-20 minute daily lessons, designed to simulate a private 1-on-1 session with Ben (which normally costs upwards of $4,997 a month and has a waiting list booked months in advance). Each session, you’ll discover a simple strategy, technique, or biohack that’s fun and easy to incorporate into your schedule as a regular habit to quickly level up one key aspect of your overall wellness. Whether you’re a busy executive looking to maximize your health and fitness without sacrificing your time or someone in your golden years looking to heal and inject more energy into your day, you’ll quickly be able to achieve your health goals in shortest time possible. Every aspect of this Quest is designed around the principle of Minimal Effective Dose to give you powerfully effective practices to elevate your fitness, health, beauty and longevity in the least amount of time. This way, you can develop the body you truly desire while having the time to actually use your new body to experience life to its fullest. You will not have to expend vast amounts of willpower to perform any of the strategies taught in this Quest. Combining powerful behavioral psychology and our cutting-edge Quest learning platform, all of the strategies you’ll learn will naturally become ingrained into life-long habits that you’ll actually love and look forward to. While the techniques you’ll learn will take you no more than a few minutes to do each day, they are not “quick-fixes” that create temporary change. Instead, these are thoroughly researched and scientifically validated methods to create permanent change in your physiology at a cellular level so you experience a powerful transformation that will last you a lifetime. It doesn’t matter what stage of life you’re at, or what your current fitness levels are, the techniques you’ll experience are designed for everyone. From the rapid biohacks, to the short exercise routines, all the protocols have been validated by science and adapted to allow anybody to benefit from. Ben has long been a leading authority in the biohacking, health & fitness, and longevity communities, with hundreds of thousands raving students and fans across the globe. And from world class athletes from the NHL and NFL, to high-performing individuals like CEOs and professional poker players — many of the world’s top performers look to Ben to bring out the best versions of themselves. This Quest is the single most affordable and accessible way to join these top performers, and elevate every aspect of your wellbeing to the peak of your potential and beyond. This is where you learn about the key parameters that make up your overall wellbeing, and what you’ll need to prepare for the coming weeks. You will also take your first benchmark test to identify your current fitness and strength levels. The relationship between your muscular strength and your longevity, and how to find that sweet spot of muscle to strength ratio. How to elevate mitochondrial density (the energy producers in your cells) to supercharge your cardio fitness and stamina. How to switch your body into a fat-burning machine by elevating your metabolic efficiency. Key ideas on how to accelerate your recovery so you can quickly rebound from soreness and naturally correct any imbalances in your posture. In week 2, you’ll start slow and gently as you’ll discover two powerful practices that will jumpstart your metabolism first thing in the morning so your body can more efficiently burn fat throughout the day. A simple morning fasted, fat-burning walk. Each day, you will increase the time you walk by a few minutes as you develop this practice into a powerful daily habit. A quick cold-hot contrast biohack proven to extend longevity and have you feeling more youthful and energetic throughout the day. While you continue the practices you learnt in week 2, you’ll start adding powerful recovery exercises to improve your mobility, flexibility and help make your body more resilient to chronic injuries. The importance of having a regular Minimum Effective dose of mobility work and how to easily incorporate it into your day-to-day schedule. A simple Functional Core Training routine you can follow along to designed to stretch any tightness you may be feeling while strengthening your core. This is where things get really exciting as Ben will show you one of the most time-efficient exercises to improve your muscular endurance, anaerobic capacity and naturally release growth hormone (often referred to as the true fountain of youth) in your body — The Tabata Protocol. You’ll discover how to use foam rollers to help loosen any tightness in your muscles and help you recover from soreness faster. A quick tutorial of the Tabata Protocol which you can follow along to with Ben in the comfort of your own home. Discover the endless benefits of this powerful 4-minute exercise routine and how you can customize to fit your current lifestyle. An in-depth look at how to use foam rollers to help improve your mobility. In week 5 of the Quest, you’ll start learning how to develop more functional strength and to get one step closer to crafting your ideal body in the least amount of time possible. A powerful 4-minute workout to quickly build lean, functional muscles with one of the most common and basic exercise equipments: The kettlebell. The super-slow strength protocol to rapidly and safely develop your strength and musculature in just under 15-minutes of exercise a week. How to induce improved blood flow to your muscles (for both muscle growth and recovery) through a “hot therapy” protocol. A gentle Yoga and deep breathing routine to encourage increased oxygen throughout your body reinvigorate your energy levels throughout the day. As you build your strength levels and improve your musculature, now you’ll learn how to take your cardio fitness to completely new heights so you stay active and energetic all day long. A bi-weekly High Intensity Interval Training (HIIT) to efficiently boost your mitochondrial density and natural increase your overall energy levels. The ultimate 7-minute body weight workout that you can do at anywhere (even if you’re travelling) to level up your cardio fitness in the shortest time possible. In week 7 of the Quest, you’ll discover incredible routines you can do periodically (in place of other routines you’ve already learned) designed to both extend your longevity and enhance your quality of your life. A quick 4-minute core plank routine so you develop both aesthetic abs but build a rock solid core that can support your lower back. A sprint version of the HIIT training you learnt last week to supercharge your mitochondrial density to a completely different level. The Metabolic Mobility Routine: Get the biggest bang for your buck in your mobility, your stamina and your fitness in a short session. A full body isometric workout to develop both your strength to muscle ratio, and sharpen your focus and mental resilience. In the final week, you will learn how to optimise for recovery by learning to take a week off every month or so, how to design your ideal daily, weekly, and periodic work, rest, and testing routine. How to develop a full Range of Motion routine you can do periodically to improve your overall mobility and dramatically reduce your risk of injury. The benefits of getting a full body massage to increase blood flow and speed up your recovery. How to use the principles and protocols in this Quest to craft your own ideal routine that fits your goals and your schedule. 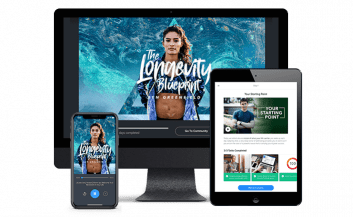 Because we believe in elevating the lives of billions/helping others rock their greatest lives, we’ve designed the Longevity Blueprint Quest to elevate fitness, health, beauty and longevity for a complete wellbeing transformation at a more affordable price than you’ll find anywhere else. Consider the average person that spends $600-$700 on a yearly gym membership, which according to latest reports, only a small fraction of people actually use after the first few months. And then you add in the cost of a personal trainer that charges anywhere between $100-$150 per hour, and you’re looking at a yearly investment of thousands of dollars that only scratches the surface of ONE aspect of your entire wellbeing, your fitness… (which is usually approached in a very inefficient and ineffective way). And so this transformational experience won’t cost you $3,000, or $2,000 or even $1,000; but just a one-time investment of $399 for a lifetime of optimal wellbeing. You won’t find this complete life shift for this price anywhere else. When you’re buying a car, you can test drive it. When you’re buying a house, you can take a tour of it. We believe you should have the same peace of mind with your education too – so we’re giving you up to 10 risk-free days to try the Longevity Blueprint Quest and see how it works for you. When you enrolled in our recent Longevity Masterclass with Ben Greenfield, you took a huge step towards a better you in every way. But that was just the beginning of your transformational journey. Now, we’d like to encourage you to take it all the way with an exclusive $796 discount on the Mindvalley Longevity Blueprint Quest. Yes, the entire Quest is now yours for just $399 instead of $1,195. Full lifetime access to the 60 day Longevity Blueprint Quest with the famed biohacker and longevity expert, Ben Greenfield. Start the journey to a fitter, healthier and more vibrant you on May 6, 2019 with thousands of others. As a special bonus, you will also get three Pre-Recorded Group Coaching Call with Ben Greenfield, himself. A one-hour session with Ben is $1,297 but for members of this quest, it will be included FREE. 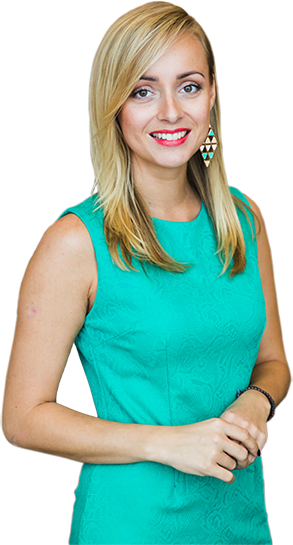 As a special bonus, you will also get one LIVE Group Coaching Call with Ben Greenfield, himself. A one-hour session with Ben is $1,297 but for members of this quest, it will be included FREE. However, this is only available for this February 2019 student intake. Did we really drop the enrollment fee by $796? That’s why you’re getting a 67% discount on the Longevity Blueprint Quest. But take note that this discount expires very soon, so please enroll immediately to secure yours. How exactly does the Longevity Blueprint Quest work? The Quest is an easy-to-follow journey towards elevating your fitness, health, beauty and longevity. Every day for 8 weeks, you’ll experience a 15 – 20 minute online micro-lesson or tutorial with Ben Greenfield. Each day builds on the last, and you’ll enjoy a rewarding sense of progress (that could lead to permanent change) with minimal time spent. By the end of the Quest, you’ll experience a complete and balanced transformation of your entire wellbeing. Will I need to sign up for a gym membership? Having a gym membership is not necessary for this Quest. However, if you have an existing membership, you can make use of certain equipment at the gym. There’s only a few basic and easy to attain tools that are required to complete the Quest. During the first week of the Quest, Ben will help guide you prepare for everything you need to get the most of out this Quest and to give you some cost-effective solutions. To get the most of out of this Quest, Ben recommends a few basic and easy to attain tools that are required to complete the Quest, these include 1 set of kettlebells, a pair of dumbbells, a yoga mat and a foam roller. These are easily found online or at your nearest health or sports store. Best part is, once you learn how to use these tools, they will serve you a lifetime. Examples of the equipment Ben will recommend includes a foam roller, a kettlebell, and resistance bands. Does the Longevity Blueprint Quest include a nutrition or diet plan? No. This Quest is specifically designed to focus on simple yet effective biohacks for improved fitness, health, beauty and longevity. For those of you who wish to later dive deeper into improving your nutrition, Mindvalley’s WildFit Quest would be your ideal next step. What level of fitness do I need to perform the exercises in this Quest? The Longevity Blueprint Quest is specifically designed to be accessible to anyone – no matter your age, or your current fitness levels. While exercise plays an important part in elevating your overall wellbeing, it is only ONE aspect of the overall strategy. What you’ll find is that you’ll only need to spend less than 30 minutes “working out” a day. With that said, if you have any prior injuries, we highly recommend you consult your physician beforehand. Ideally, yes, because consistency helps ingrained the strategies you’ll learn as lifelong habits, and into a lifestyle. That being said, we know that life can get a little overwhelming sometimes – so it’s perfectly fine to do your daily sessions at different times, or miss some days and catch up later (the sessions are only 15 – 20 minutes, so catching up will be easy). What’s important is you stay committed to the overall process, and finish the Quest. When does the Longevity Blueprint Quest begin? The Quest starts on May 6, 2019. Starting that day and for the next 60 days, you’ll receive daily training from Ben and her team on your Mindvalley mobile phone app or in your Mindvalley dashboard. You’ll receive an email the day before the Quest begins and then every day throughout the 60 days. You only need 15 – 20 minutes for each daily lesson. However, the Longevity Blueprint Quest is designed as a 60-day experience which systematically levels up different aspects of your wellbeing, with each lesson building on the next. On top of that, the fact that you’re doing it with the support and energy of the community makes it even more powerful. The biohacking strategies that you’ll learn have not only been scientifically validated, but Ben personally uses them on himself and has used them on his many clients. On top of that, the Longevity Blueprint Quest gives you training from one of the leading authorities in the world of biohacking and longevity, with a track record of elevating the fitness and health of some of the world’s top performers — from NHL and NFL athletes, to top CEOs, to extreme endurance competitors, and even champion poker players. You don’t even need to decide now. Just grab that exclusive $796 discount, try it, and see what the Mindvalley Longevity Blueprint Quest does for you. We’re certain you’ll be overjoyed with your experience. Ben Greenfield has turned my life around. I thought I was in good shape, I looked to Ben to help me get into better shape. Wow, was I wrong before. I am now in the best shape I have ever been in after 5 months of training. I have never been this strong in my life; at 39 years old I feel alive and like I can actually take on the world! His guidance and training are priceless. Ben Greenfield has made my dream a reality. Ben takes a very focused personal interest in his client’s fitness goals. Every workout is different and each set addresses a weakness to improve. He encourages varied sports and helps you develop the skills to succeed. My exercise had become routine and I thought I was lucky to maintain my fitness. Ben encouraged me [to] set new goals and try harder. His coaching and training helped me to eat and exercise smarter. In 2 months I lost 12 pounds, lowered body fat 4 percentage points, strengthened an injured knee to avoid surgery and lowered my blood pressure. I trained with Ben for over a year. In that time I learned and developed a lifetime of healthy behaviors. Short-term, Ben guided and motivated me to have the best Bloomsday performance thus far in my life! Long-term he helped me get off the “weight roller coaster” I have ridden since I had my children! . You really have helped me make permanent changes. Thank you Ben! When I was younger, I took my health for granted and going to a gym never really appealed to me. I am approaching 60 and now I don’t take anything for granted! Although I don’t have any competitive athletic aspirations, I decided to find a top trainer who is an elite athlete. I have been working with Ben Greenfield for about a year. I have never met anyone so enthusiastic about health and fitness. I actually look forward to going to the gym and training with him. He has a joy about fitness that is contagious. All my friends have noticed that I look better, and ask if I am working out. I love having more energy and just being able to do every activity better. With Ben’s help I know that I am going to live longer and live well – thank you, Ben!